In Fargo, North Dakota one of Vandal Savage's descendants inhales the Black Mist and is transformed into a muscle bound behemoth. Meanwhile Clark's powers have returned thanks to the overdose of Kryptonite and he destroys the Puzzlerbot. Steve Trevor informs him that despite the fact that he has his powers back and that the Kryptonite burned off the poisoned cells that Savage infected him with the Kryptonite is killing his healthy cells too. Clark reunites with Wonder Woman in time to overhear transmission from the stolen Watchtower. Savage fires a beam into space but before Superman can find out why he is attacked by the kid from North Dakota. Superman tries to reason with him but the kid refuses to listen and insists he is a barbarian. Wonder Woman informs Superman that the beam Savage fired has struck Jupiter and now that planet is expanding. Superman realizes that the kid was a distraction and flies to where his Fortress is located and finds that Vandal Savage is trying to steal it. Story - 4: The story begins with a skinny kid getting all 'roided out and Clark discovering that an overdose of Kryptonite radiation has altered his body chemistry. Sounds like Pak misses writing the Hulk. That was a joke. It wasn't a complaint. I loved Pak's run with the Hulk. I enjoyed this issue. It was more like the Greg Pak ACTION COMICS I had come to know and love instead of angry, powered down Superman being angry and powered down. Superman looked genuinely happy to have his powers back despite the fact that they are killing him. There was a nobility about the character that has been missing for the last six months. Yes, he was willing to sacrifice himself before but seeing him power through despite the pain and then trying to talk the Conan kid down did my heart a lot of good. I liked current Superman for the first time in months thanks to this issue. I haven't been reading SAVAGE DAWN but Pak and Kuder make it easy to catch up on what I missed with minimal exposition. This made this issue accessible and fun to read on its own despite the fact that it's part of a larger story. That is not an easy trick to pull off so kudos to Pak and Kuder for pulling that off. This issue doesn't make up for the past six months nor does it retroactively make me like those stories. It did entertain me and I enjoyed what I read. Superman was acting more like the Superman I want to read about and you can tell that this particular era is winding down. Maybe someday I'll look back on all of this and have more of an appreciation for what the creators were trying to do. For the moment I will enjoy this issue and hope I enjoy the next one. Art - 4: The art was amazing throughout the issue. From the "hulk out" at the beginning of the issue to the full page splash of Clark trapped in the Kryptonite to how amazing Diana looked to the fight at the end the artwork never failed to excite or engage me. The kid's head on the musclebound body was a little disturbing but it was meant to be so the art team did their job. As much as I haven't liked the stories over the past few months the artwork has rarely let me down and this issue was no exception. Cover Art - 4: Now this is a cover. 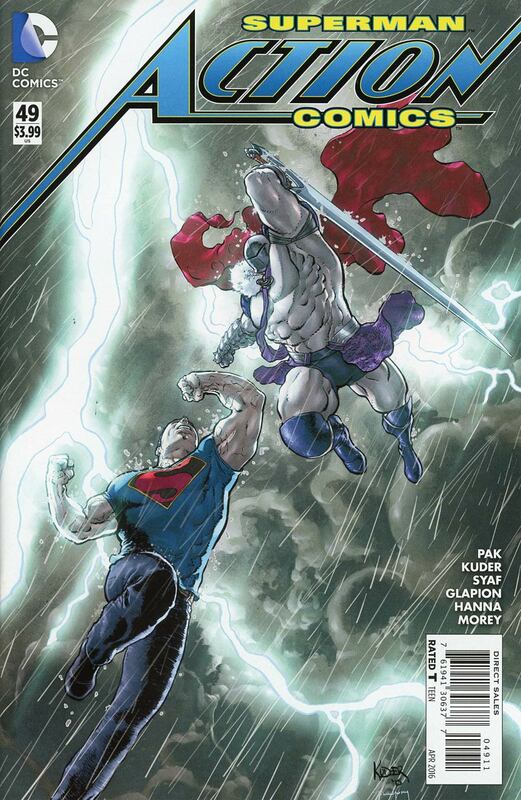 A storm rages in the background as Superman and a barbarian fight in the sky. This cover is exciting and looks fantastic. 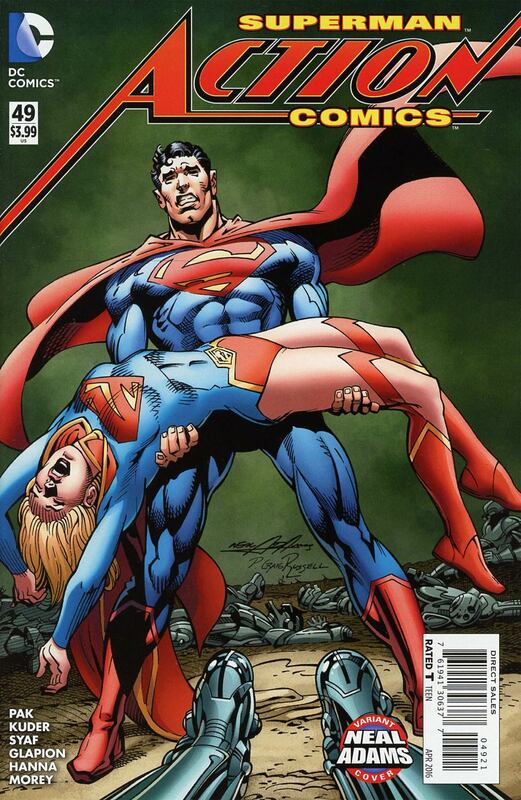 Variant Neal Adams Cover Art - 3: Normally I like Neal Adams but this cover is awkward. I get that he's trying to ape CRISIS #7 but it just looks off.